I'll be adding it to the next run of my ETC benchmark. I love herbal adaptogens, especially Rhodiola, and Ashwagandha. Adaptogens are a rare, special breed of herb. Pretty much every game and software developer should at least understand what adaptogens do. How I wish I knew about adaptogens over the past 20+ years! So far, the most powerful and reliable blend of adaptogens I've tried is "Adrenal Health - Daily Support" from Gaia. Their plain Rhodiola, Holy Basis, and Ashwagandha extracts are also very good. The downside to adaptogens: If you take too much, you're just not going to feel tired. If you *like* feeling tired, be cautious of dose. The slight CNS stimulating effect can be too energizing for some people, so go especially slow at first and only take a tiny amount only in the morning. If you just want to get your feet wet and play around with small amounts of adaptogens, try some Rhodiola extract in tea. So far, Ashwagandha feels the least stimulating to me. "The adaptogens Eleutherococcus senticosus, Rhodiola rosea and Schisandra chinensis were reported to be safe in acute and subacute toxicity studies. 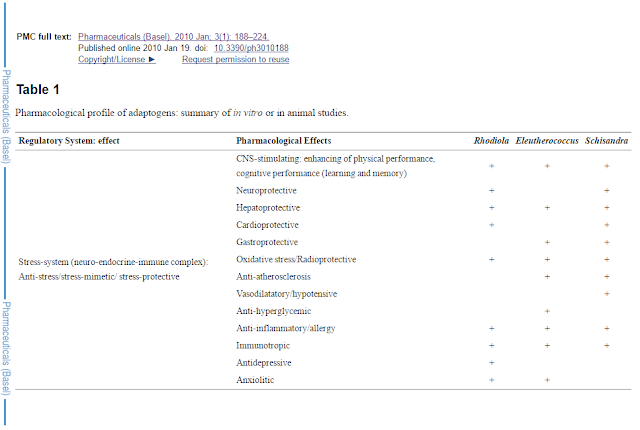 Moreover, adaptogen induced state of non-specific resistance to highly toxic chemicals (e.g., chlorophos, phosphorus, cyclophosphane, strychnine, aniline, sodium nitrite, narcotics like sodium barbital, hexenal, chloralhydrate, benzene, acetone, ether, etc.) and microbes demonstrated in many pharmacological/toxicological studies , actually implies that they have an anti-toxic activity. For example, it was demonstrated that repeated administration of Rhodiola rosea extract during 10 consecutive days decreased LD50 of 40% ethanol in mice from 24.1 ml/kg to 55.2 ml/kg. It was also shown that salidroside shortened (from 100% to 19%) the duration of benzene induced sleep in rats"
What I wish I could find is a concise breakdown of the exact properties of each adaptogenic herb. For example, how stimulating is each one? How powerful is the cortisol lowing/normalizing effect of each, etc. BTW - if you for some reason are freaked out by the concept of herbal medicine, the stimulating effect of caffeine feels much more powerful than any adaptogen I've tried. Also, adaptogens are not addictive like caffeine is. I have more consistent and reliable energy on adaptogens, and overall less energy when drinking caffeine.